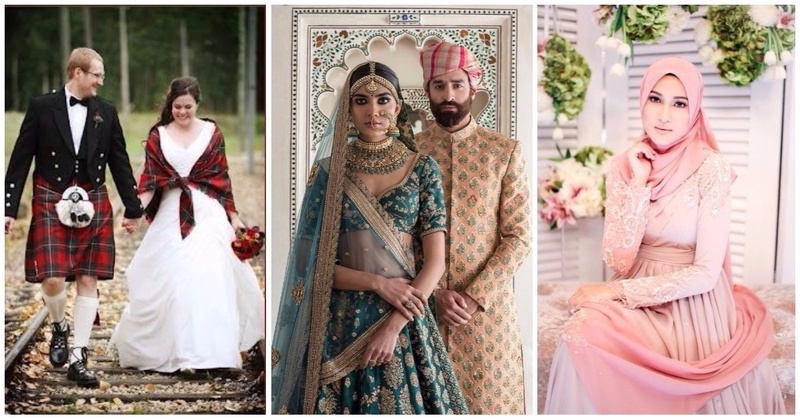 Here’s What Wedding Dresses Around The World Look Like - And Our Lehenga Has Some Serious Competition! The world is filled with so many people, so many cultures and so many wedding dresses! Thai wedding dresses are usually made of silk and are wrap-around style with a drape going over one shoulder. Modern brides nowadays go for various other materials as well as they offer a larger range of prints/colours. However, pastels and ivory colours are mostly worn. Weddings in Ghana are all about bright colours! Mongolian wedding outfits consist of a garment called ‘deel’ which both the bride and groom wear. It has been worn for centuries by Mongols. Nigerian brides wear bright dresses with a kind of bandana/head-piece called gele. Malaysian weddings are often Muslim. Malay brides wear a baju kurung or baju kebeya, which is a sarong over a long dress. They also cover their heads, similar to a hijab. Chinese wedding dresses are red in colour to symbolise love and prosperity. Japanese weddings have the bride dressed in a white kimono and a headdress called tsunokakushi. This symbolises purity and maidenhood. Macedonian brides get married in gold, red and white smocks with a string of gold coins on the dress. Scottish weddings have the groom wearing a kilt with his clan’s colours. After the wedding, the bride who is in a white gown, dons a shawl with matching colours to symbolise becoming part of his family. Wedding dresses in Bhutan are made with colourful prints and colours, with the fabric draping and folding around the body in a particular way. They are called ‘Kira’. Afghan wedding dresses are bright and colourful, with embroidery. They usually have an empire cut and are flowy. The colour green is common as it signifies paradise. Sri Lankan wedding outfits for brides are ivory, gold or red sarees with veils. Sri Lankan grooms wear an outfit called mul anduma with an elaborate red and gold jacket with emphasized sleeves. Indian wedding dresses are usually lehengas! Though sarees are also worn in some parts of India like Maharashta and South India. So which one did you like the best? Let us know!